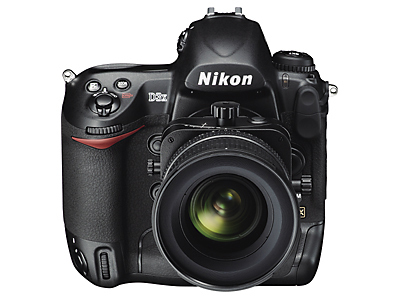 Nikon today announced the D3X, their newest professional Digital SLR. In a widely anticipated move, the D3x will feature a 24.5 MP CMOS sensor in a body that otherwise appears identical to the current D3 professional model. As a concession to the doubling of sensor pixels, the new D3x will top out at a continuous 5 FPS, compared to the 9 FPS of the current D3. Shooting in 10 MP crop mode the D3x can reach a speed of 7 FPS. Sharp-eyed readers will notice that the D3x sensor specifications exactly match those of the recently introduced Sony A900. Nikon makes no claims to have designed or manufactured the D3x sensor so it is likely the same sensor as the Sony A900 with customized Nikon image processing. What was NOT expected is the $8000 price tag Nikon USA has announced for the new D3x. With the 24.5 MP Sony A900 selling for $3000 and the now shipping 21.0 MP Canon 5D Mark II with an MSRP of $2699 most expected a selling price nearer the $5000 D3. Since the Nikon D3x and Sony A900 appear to use the same Sony 24.5 MP sensor it will be interesting to see if the D3x can effectively compete against a full-frame rival that uses the same sensor and is selling for about one-third the price. The Nikon features a 100-1600 ISO range, with expansion down to ISO 50 and two steps up to ISO 6400. This compares to the Sony A900 ISO range of 200-3200 with expansion to 100-6400, which is a virtually the same sensitivity rating. No doubt Nikon has worked their normal magic with their Image processing chips in the D3x, but will that justify three times the price? The Canon 5D Mark II has also started shipping, and we will soon know if the newest Canon full-frame is truly useful at its expanded ISO range to ISO 25600. The Press Release is on page 2. Images of the new D3x are on page 3. Nikon states the D3x will be available beginning in December 2008 at Nikon dealers. Thats what the extra 5k buys you. If the above doesn't matter to you, then it doesn't make sense to spend that much extra for one. Much like most pro type things in life (racing parts for a car, pro mechanic tools, pro studio equipment). They are a lot more expensive then normal prosumer stuff. If it doesn't matter to you then it's not worth it. Sure in most settings the 3k prosumers will perform practically identical to the pro cameras, but when you get in to challenging situations thats where your pro camera does the business. Most pros would not buy a camera if it didn't have 2 memory card slots for real work. The risk is too much for them. As a response to the audiophile article we had yesterday, I said there are getting to be too many articles on cameras and other non-pc-related topics. You guys can do what you want, it's your show... But if this continues, I'm just going to stop coming here every day. Those familiar with Nikon will know that Nikon frequently produces different versions of a camera for specific work. The D3x is clearly focused for studio work, clearly seen with Base ISO of 100 and available ISO of 50 in Lo settings. This is mean to compete with Canon's 1Ds camera. I agree, those professional photographers with enormous amounts of cash vested in Nikon glass will most likely willingly/want to purchase this camera for studio work. This is the market this camera is intended for. Nikon makes no claims of High ISO Low noise performance, in my mind that is what the Nikon D3 is for. If you want High ISO low noise performance, get the D3. If you have full control of lighting, as you would in studio work, you want to get as low ISO as you can, and this is what the D3x is aimed for. As far as Sony dilemma, there has been no claim made from both Nikon or Sony if the same sensor from the A900 is being used. 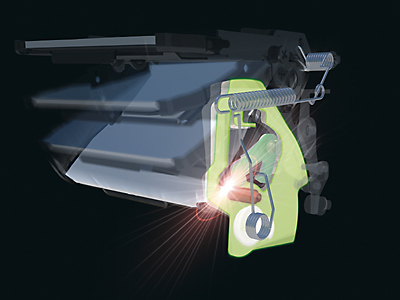 Although Nikon has used Sony sensors in the past, Nikon does design/spec their own sensors. Regardless, for the most part, Nikon cameras using Sony made sensors, ISO and Noise performance has always been better than what Sony can do in their own cameras. I'm sure Nikon's processing has a lot to do with the end result of the image. So even if the sensor is the same, the processing done makes a difference. For example, if the sensor in the D3(which I think is NOT speced/designed by Sony), D300, and D700 is sony made, from what I read when I was in the market for a DSLR body, no Sony camera had comparable ISO/Noise performance, processing makes the difference. This may very well be intended to compete with Canon's 1Ds mkIII. But that will be a short competition indeed. Canon is expected to replace that camera with a newer one in March or so. Considering that the 5D mkII uses an improved version of the 1Ds mkIII sensor (actually, the same base sensor, but with new gapless micro lenses, and newly computer optimized color filters and anti-aliasing filter), and the new Digix 4 processing chip, the 1Ds mkIII has already been bettered. What will Nikon therefore be competing with come spring? ... but it has been delayed. Several Professionals have commented on Forums that they can buy a Sony A900 and several Carl Zeiss Pro lenses for the Sony for less than the price of the D3x. It will matter to some Pros. I do agree a couple of thousand will not sway a Pro invested in a particular system, but 3 times the price for the same sensor is certainly reason to at least pause and consider.